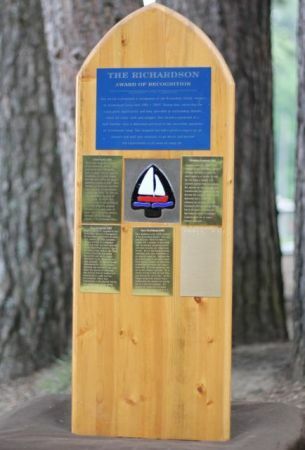 This award is presented in recognition of the Richardson family, owners of Arrowhead Camp from 1981-2003. During their ownership the camp grew significantly and they provided an outstanding summer home for many staff and campers. This award is presented to a staff member who is dedicated and loyal to the successful operations of Arrowhead Camp. This recipient has had a positive impact on all campers and staff and continues to go above and beyond the expectations in all areas of camp life. We are pleased to recognize Claire Christie as the 2017 recipient of the Richardson Award. Claire first came to camp as a young Fantasia camper and she has developed into an outstanding staff member and a huge asset to the camp. She has spent 11 summers at Arrowhead as a camper, LIT, Sailing Instructor, Sailing Director, LIT Director, and her current position as one of the Junior Directors. Some of Claire’s strengths are her work ethic, her strong leadership skills and her effective communication skills. Her bubbly, outgoing personality has allowed Claire to excel in all areas of camp life but specifically camp programs, portraying characters, and having fun in all camp events. She also has the unique ability to be an effective supervisor and evaluator of all staff, while maintaining positive relationships and friendships with everyone. She knows when it’s time to be serious and time to be fun. She can always be counted on to help in any area in need. This year Claire also helped to plan, coordinate and facilitate the spring program at Arrowhead. She was a huge part of the success of the spring and summer programs. We missed Claire at camp last summer and we feel very fortunate that she returned this year. It’s been great to see her grow up at camp and become a huge part of the Arrowhead family. She’s a very deserving winner of this award. Nick Amlin is one of the 2016 winners of the Richardson Award. Nick has been at Arrowhead for 11 summers as a camper, LIT, Biking Staff, Biking Director, Property, Program Director and the Site and Facility Director. Nick has grown into an outstanding staff member and a major part of the Arrowhead leadership team. He is very loyal and cares a great deal about the camp. He leads the way in volunteering for any job, has an outstanding work ethic and shows initiative in all areas of camp. Nick takes great pride in helping to improve things at Arrowhead and he has contributed to some major projects and renovations over the years. He has also helped to open up the camp in the spring and has had a huge impact on the spring and fall programs. He also likes to work with campers and staff and has developed an innovative wood working program at camp. Nick can also successfully plan great programs and portray a variety of camp characters. We are very proud of Nick and feel that he is a worthy recipient of this award. We are pleased to recognize Jordana Bengall as one of the recipients of the 2016 Richardson Award. Jordana has been coming to camp for the past 11 summers. She has worked as a Nature staff, Crafts/Nature Director, Theatre Director, Program Director and Girls Camp Director. Jordana is extremely dedicated to the camp and has had a huge impact on so many campers and staff. Throughout her time at Arrowhead Jordana has developed a strong passion and respect for nature and the environment. She has used this interest to have a huge influence on the entire camp. Jordana has implemented and developed many new programs, games, projects and events that promote nature and outdoor education in a fun and creative manner. She can be counted on to volunteer for any activity. She leads by example and she takes the time and care to get to know every camper on an individual basis. These skills have allowed Jordana to become a key member of the camp’s leadership team. She is a very deserving recipient of the 2016 Richardson Award. Alec is one of the 2015 recipients of the Richardson Award. He has been a camper, an LIT and he’s worked at camp for 5 summers as a Canoe Instructor/ Tripper, Canoe Director, and Tripping Director. In these positions Alec has worked hard to further develop on the camp’s outdoor education, wilderness camping and tripping program. He has helped many campers and staff develop an appreciation for the outdoors and canoe tripping. Alec has also planned many new routes and a variety of sites for caping out and trips. He has had a hand in expanding the camp’s music, fitness and theatre programs. Alec is very passionate about these programs and he’s helped to promote these interests to the entire camp. He is a warm, kind and compassionate counsellor who is an excellent role model for all campers and staff. Alex has had a huge impact on the day to day success of the camp and he’s touched the lives of many campers. He has developed into an outstanding leader and a vital part of the staff team. Marty is a 2015 recipient of the Richardson Award. He has grown up at Arrowhead as a camper, participated in the LIT program and worked at camp as Sport’s Staff, Swim Instructor/ Lifeguard, Waterfront Director, Kitchen Manager and LIT Director. Marty has has a huge impact in many different areas of camp. Some of these areas include program planning, canoe tripping, development of the camp’s leadership program and participation in camp programs. Throughout his time at camp, Marty has developed into a very loyal and dedicated staff member who ares a great deal about the success of the camp. He has a passion for camping and thrives working in a summer camp environment. He is an effective communicator, strong leader, very organized and a team player. These skills combined with his love of camp have made him a huge asset to the camp and the campers. Alex McNulty is one of the 2014 recipients of the Richardson Award. Alex first camp to camp as an energetic 7 year old and quickly become an important part of the Arrowhead Family. Since then he has spent 14 summers at camp and he has worked as a Staff Floater, Biking Staff, Biking Director, Property Director and in his current role as the Junior Director. This summer he has been responsible for a number of accomplishments and improvements to make Arrowhead a better place. He acted as the leader of the spring work crews, he developed and implemented a new fishing club and he reinvented the camp’s Honor Roll Program. He has a passion for the outdoors and he’s been able to pass this along to many campers and staff. Alex is a very positive member of the Arrowhead team and he is very creative, motivated, and fun. He has worked hard to pass these traits on to the campers and staff. Alex is also very loyal and cares a great deal about the camp. One of our Richardson Award winners this summer is Matthew Teague. He has spent 12 summers at Arrowhead coming to camp as a young boy and growing into a strong leader and important senior staff member. Matthew has worked at camp for 5 summers as a Ski Staff, Waterski Director, LIT Director and as the Boys’ Camp Director. Matthew excelled this summer by ensuring that all the campers were well supervised and he interacts with them in a positive, easy going manner. One of his strengths is his ability to communicate effectively. Matthew communicates with the campers, staff and parents in a calm, respective, professional manner. He also had done an exceptional job dealing with some of the challenging campers ensuring that they were having fun in a healthy and safe environment. Matthew is also very loyal to the camp and he cares a great deal about the success of the camp and this is evident in everything that he does. He has become an excellent role model for our younger staff and campers. He also is a talented musician who often performs for the camp. Carolyn Munro is a recipient of the 2014 Richardson Award. Carolyn has spent 8 summers at camp and she has contributed a great deal to the success of the camp. She has worked as a Swim Staff, Waterfront Director, LIT Director and this summer she is the Girls’ Camp Director. She has spent 5 years on staff and she has an incredible work ethic that allows her to excel in a leadership role at camp. One of Carolyn’s strengths is taking the time to get to know each and every camper and staff member on a personal level. This allows for her to have an incredible rapport with all the campers and staff. She also has a unique sense of humor which allows her to excel in camp programs, theatrics and all camp interactions. Carolyn also deals that the health and safety of all campers and staff. She has the unique ability to take her job very serious, but also she is able to have fun and silly when it’s necessary. We thank her for all her efforts in making Arrowhead a special place. Eamonn Corrigan is this year’s winner of the Richardson Award. He has been a long time camper, LIT and staff member. As a staff member Eamonn has worked as a Lifeguard, Swim Instructor, Waterfront Director and in his current role as the Boy’s Camp Director. He is very creative and he has introduced the campers to many new events and activities. He helped to implement, plan and a present a number of quality theatre arts programs. A highlight this year was the third session musical “The Lion King”. Eamonn is a talented artist and musician and his passion for camp rubs off on everyone. He is an excellent role model for the campers and younger staff. Eamonn shows a genuine interest in campers and he takes the time to get to know each of them. He takes pride in his work and he is dedicated to the success of the camp. All of this has made him a huge asset to the camp. The 2013 winner of the Richardson Award is Ben Hayes. Ben has been at camp for 12 summers. He has worked at camp as a Water Ski Instructor, Ski Director, LIT Director and Junior Director. Ben has developed a keen interest in the successful operations of the camp. He is very loyal and cares a great deal about Arrowhead. He has been a huge asset for the last two years helping to get the camp opened and coordinating our spring staff. Ben was also a leader in facilitating the school groups. He ensured that the staff, campers, parents and teachers were looked after in a mature and professional manner. This summer Ben took on a new role as the Junior Director and he helped to run a successful staff orientation. He is an effective mentor for the campers, LIT’s and staff and is always a team player. Ben’s easy going attitude and demeanor make him an effective leader and an important part of the camp. He is patient, funny, energetic and always willing to lend a hand. We thank Ben for his dedication and many contributions as a staff member. The 2012 Richardson Award recipient is Liza Marner. Liza has been coming to camp for nine summers as a camper, LIT and staff member. Liza has worked as a Water Ski Instructor, Ski Director and Program director. She has grown into an effective leader who is respected and admired by all campers and staff. The camp as a whole benefits from Liza’s innate ability to keep her energy level constant, her mood positive, and to show compassion to each and every person who crosses her path. In her current position as the camp’s Program Director Liza has been able to help facilitate a number of amazing camp events, such as the first ever Arrowhead Games. This was a highlight of the summer and an event that will continue for years to come. Liza is well organized, flexible and a team player. Her dedication and commitment has had a direct impact on many campers and staff. Bethany is the co-recipient of the 2011 Richardson Award. Bethany has been at Arrowhead for twelve summers and she has always exhibited a string passion for camp. Since becoming a staff member Bethany has worked as a Sailing Instructor, Sailing Director, Day Camp Director, and her current position as the Camp Administrator. Bethany is extremely well organized, dependable and cares a great deal about the camp. She has a great work ethic and helps significantly in the smooth operations of the camp. She is an excellent role model for the campers and fellow staff members, providing guidance for many. Bethany has had a huge impact on the camp and we would like to recognize her for dedication and loyalty to her job and to the entire camp. Nick is the co-recipient of the 2011 Richardson Award. Nick has been at camp for the past thirteen summers and has spent five years on staff as a Sport’s staff member, Sport’s Director, LIT Director and his current role as the Boy’s Camp Director. Nick’s contributions at camp include his strong program involvement, interpersonal skills and dynamic personality. Nick leads by example and he is a huge asset to the camp and to the entire staff team. For the past two years Nick has been the spring camp coordinator and he has done an excellent job running the outdoor centre. He is well organized, reliable and flexible in his position. Nick has had a huge impact on the camp and he has had a tremendous influence on many campers and staff. Katie Hammond is the 2009 recipient of the Richardson Award. During Katie’s 4 years on staff she has worked as a Tennis Instructor, Director of Landsports, and for the past two years as our Leader In Training Director. Katie’s positive attitude, fine-tuned organizational skills, perseverance and approachable nature all contribute to the success of the camp and the LIT program. Her dedication to her LIT’s and co-workers makes Katie a strong mentor and resource for our young leaders. She is always willing to take on new projects and help out behind the scenes. As a result of Katie’s loyalty and hard work she has helped provide a fun and safe environment to all who attend camp. Katie’s voice carries throughout the camp and her laughter is contagious to all who hear it. Dave Muddiman is the 2008 recipient of the Richardson Award. Over the past 10 years Dave has been a camper, LIT, a member of our sailing staff, our assistant waterfront director and most recently our waterfront director. He has developed excellent leadership skills and contributes in all areas of camp life. Always the first to jump in and lend a hand, Dave uses his initiative to help those around him and make the camp a better place. His warm personality rubs off on the campers and staff. He is always willing to help out and often goes beyond the call of duty. As the camp’s waterfront director Dave ensures that the campers are having fun in a safe environment. His passion for camp life is evident in everything he does and he is a special member of the Arrowhead family. Dave is the 2007 recipient of the Richardson Award. Dave has been a camper, LIT and staff member at Arrowhead for eight summers. As a staff member he has continued to grow and develop into an outstanding leader. He brings a high level of energy and enthusiasm to all camp activities. He will be fondly remembered for his many impersonations and crazy costumes. Dave has the ability to make things fun and entertaining for the entire camp. He is also a competent life guard and he plays an important role in maintaining a safe waterfront. Dave takes pride in his job and is very dedicated and loyal to the success of Arrowhead Camp. Christine Lusczcek is the 2006 recipient of the Richardson Award. Christine has been at camp for many years in a variety of roles. She’s been a camper, LIT, counselor and Water Ski Director. Her passion for water skiing and wakeboarding has helped to further develop this activity. She is loyal, dedicated and a positive influence on campers and staff. Christine is always willing to help out in all aspects of camp life. She helps to make Arrowhead a special place for so many campers and staff. Chris is the inaugural recipient of the Richardson Award. Chris worked his way through the ranks at camp. He first came to Arrowhead as a young camper and then took part in the camp’s leadership program in 2001. Chris worked as a water ski and wake board instructor for the summers of 2002 and 2003. In 2004 he was promoted to the head of water skiing. In 2005 Chris worked as one of the directors of the camp’s leadership program. Throughout his many years at camp, Chris was always positive, dedicated, and an important member of the Arrowhead family.